This year was a bit more sedate for me for the most part, though there was the uncalled excitement of the cager sideswipe while riding Yoshie to work in February; which was balanced out by the addition of Valencia to the stable. I changed jobs for the better (mostly, it's still work...), Martha continues to put up with me and my two sons continue to grow and do well in school. For 2012, I must confess I have once again slacked off on the riding, managing to accumulate only 16,915 miles. This is down from 2011 where I accumulated 17,360 miles. 2012's meager totals bring me to a total of 131569 miles since 13AUG2006. Sigh. To be fair though, I've been working as a contractor since May of 2012 in a gig which involves working from home full time, no commute riding. The most shameful point? My '87 BMW R80 Airhead is still shy of the 100,000 Mile Mark! Over 26 years old and her odometer reads: 97,982. Of those, only 3998 were done in 2012. Yoshie, my 2006 Suzuki V-Strom/Dauntless Sidecar Rig, sits in the garage waiting for more consistent riding when next I have a job that requires daily commutes. 37,551 Miles on her odometer, only 2565 miles done in 2012. On the plus side, Valencia, my 2011 Ural Patrol which I picked up at the beginning of March 2012 with 39 Km on her odometer, got the majority of the miles for the year: 17,255 KM which works out to 10,353 Miles. As with last year, I present to you a compilation of photos from 2012, all bundled in this youtube video. 480p resolution is minimum required. 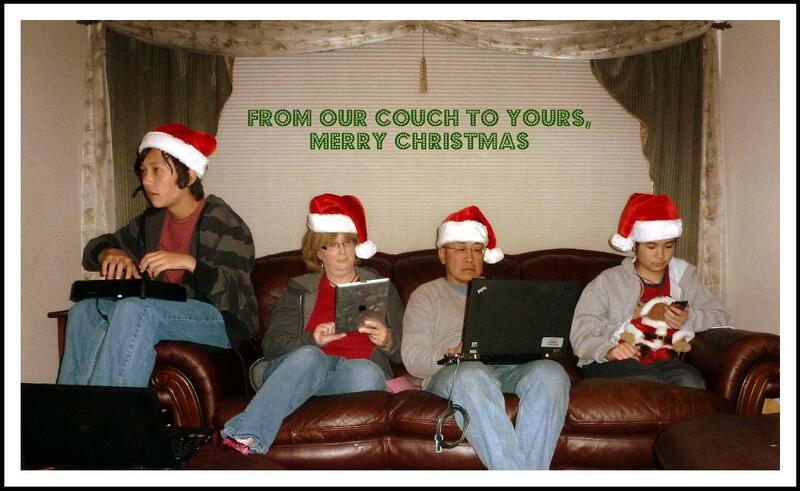 My family and I wish you all a very Happy New Year. Here's hoping you get the best rides and I look forward to reading about them. May you and your motorcycle(s) find those special moments when both you and the machine are one, whether leaning joyfully into that tight curve or discovering that special place for quiet thinking. A bit of a late start this fine morning, leaving the house a little after 9:00AM with temperatures in the low 20s and the sun shining brightly in the sky. I elected to make up some time by slabbing it up I-25 to the US36 highway into Boulder. One hour later, I'd transited through Boulder and gotten on CO Highway 119 heading west into the mountains. I turned off just a few minutes into the ride up Boulder Creek Canyon to get on Sugarloaf Road. This road climbs quickly from creek level and soon I was passing by the summit of Sugarloaf Mountain. Lots of snow on the trees and sides of the road, and there were long stretches of the road that were thinly covered in snow as well. Quite idyllic actually, the morning was quiet, there was no traffic and the rocky formations alongside of the road looked like huge chunks of chocolate liberally covered in white frosting. 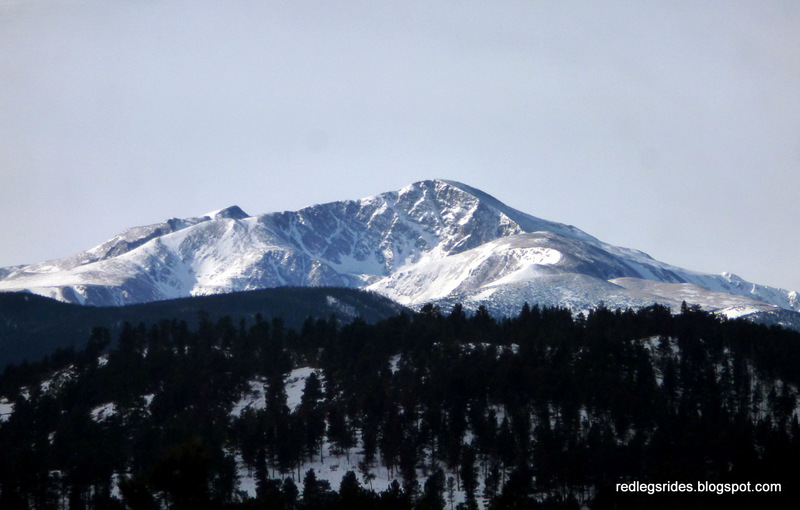 As I neared the junction of Sugarloaf Road and CO Highway 72, I would glimpse views of far off snow-covered mountain peaks, views that kept pulling me forward; always trying to get closer and see what Mother Nature had to offer today. I motored onto CO72, a.k.a. the Peak to Peak Highway, heading north along this mostly deserted road. Conditions on this road were fair, with the occasionally patch of snow and ice to keep things interesting for two-wheeled traffic. 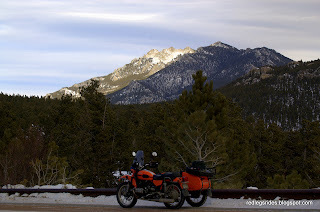 As I was riding on Valencia, my 2011 Ural Patrol, these icy patches were just a part of the scenery. Temperatures remained in the low 20s for the most part, and things would get a bit brisk when I rode through areas shaded from the sun, but all in all, quite the enjoyable ride. Once you get north of the small town of Ward, you come to the junction of CO72 and CO7. 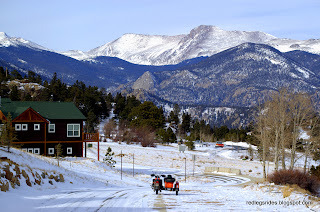 Turning left or NW, I headed towards Estes Park, the city next to the Rocky Mountain National Park. One of the first sights you see is the magnificent peak of Mount Meeker. Continuing along on CO7, I headed along at an easy pace with Lilly Lake being the furthermost point planned for the day. On the way there, I spotted the tops of the Twin Sisters Peaks, subtly highlighted by the sun for one's viewing pleasure. Arriving at Lilly Lake, the views were not conducive for posing Valencia in the foreground so instead, please enjoy this panorama of frozen Lilly Lake. Although the plan had been to just ride to Lilly Lake and turn around, I was running a bit low on gas at this point so I motored into Estes Park to tank up. The mountains belonging within the Rocky Mountain National Park that are visible from Estes Park were looking a bit naked, not a lot of snow upon them. Fueled up, I retraced my way back to Mary's Lake Road where I found a suitable view of the nearby mountains. 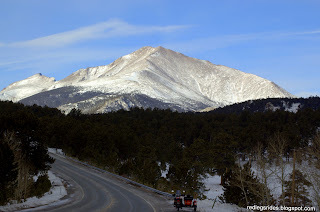 Continuing to retrace my way back towards the south, I meandered my way back towards the Long's Peak scenic overlook. Turning back onto CO72 and winding my way further closer to Denver, I neared and stopped at the historic site of Saint Malo Retreat Center and the Saint Catherine of Siena's Chapel. It's a small church set on a small flat area with Mount Meeker imposingly in the background. I made my way south, and soon enough was back in the town of Boulder. Had a bit of a surprise while sitting at a traffic light waiting for it to turn green. I hear a small voice trying to get my attention, I looked to my left and there was this cute little girl, window open and her seating on a child's seat, asking me how I was doing. I could see her mother listening from the driver's seat. I replied that I was fine and thanked her for asking, which brought a big smile on her face. Thinking that was the extent of the conversation, I turned my attention to watching for the green light. The little girl spoke up again, snagging my attention once more. She stated, quite firmly I might add, that she was happy I was wearing a helmet! I replied that my wife is also happy that I wear a helmet....she and her mother both smiled approvingly. The rest of the ride was quite uninteresting, except for some slow-n-go traffic on US270 caused by some construction and also the sight of two patrol cars in the median who'd pulled over a car. The cold was starting to get to me a bit at this point I'll admit; but I didn't want to stop and put on my heated vest. The stop-n-go traffic actually was a welcome respite from the wind chill factor engendered while moving at highway speeds in temperatures that never went above 30°F. The pace of the traffic picked up as we neared the I-225 interchange and soon I was feeling the chill creeping past my multiple layers of clothing. I got home around 4:30PM, a bit chilled but still happy with Valencia's performance, the sights I'd seen and the highlight of the ride, my conversation with that little girl. Hopefully she'll grow up liking sidecar motorcycles. Slow, slow, slow day at work....big surprise with most folks taking vacation, right? I was quite stir-crazy by the time the last meeting wound down and so headed out for a calming ride. 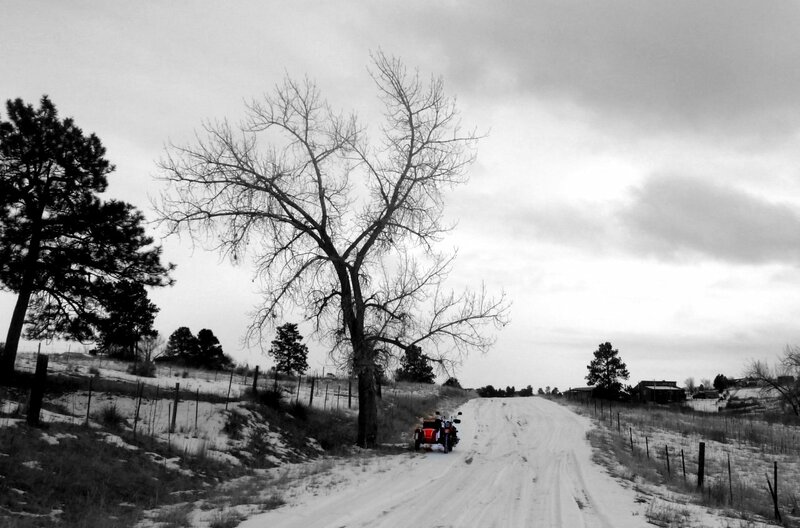 The temperatures were in the upper teens, overcast skies, slightly windy and snow still covering neighborhood roads.....there really was no excuse not to ride, right? The idea was to try and capture a picture of the last Winter Moon for 2012. Moonrise was predicted for 4:28 PM and I got there a bit too early. To kill time, I wandered about the Travois neighborhood's snow-covered roads looking for picture points. As you probably suspect, the overcast skies became snowy skies and it started lightly snowing on me as the time neared for the moonrise. Knowing there'd be no view of the moon at this time, I rode home instead in the very lightly falling snow. The motorcycling gods smiled upon me overnight and we woke to about three inches of snow in my surrounding neighborhood. First of course was the opening of presents with the family and a sumptuous breakfast from my loving wife. By 9:00AM I was geared up and motoring out of my snow-covered neighborhood streets, heading south towards a more rural neighborhood that lies south of Inspiration Drive and west of the town of Parker. 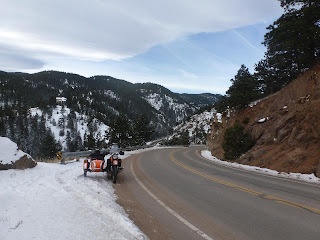 These neighborhood had good accumulations of snow on their roads, and very little traffic when compared to the main drags so it was fun snow riding for me and Valencia, my 2011 Ural Patrol Sidecar Rig. Temperatures were in the mid-single digits and it felt quite bracing while riding at speeds above 45 mph, under 45, it was quite comfortable. Valencia's new Heidenau K37 dualsport pusher tire made for good traction and I never had to engage the 2WD function the whole time I was out. I cruised these small ranch developments and looked for scenic spots to pose Valencia by. Haze and clouds covered the front range mountains so no views of the peaks today. After leaving the above snow-covered wonderland, I headed north on Gun Club Road towards Powhaton Road off of Jewell Road. These roads were snow-covered as well, though Gun Club Road being a main drag had been plowed much more than the other roads. I ended up on Smith Road, heading west towards Tower Road and a gas station near where I used to work for Sungard Availability Services. Fueled up again, we made our way to a planned but not yet begun development near the Green Valley Ranch neighborhood. The roads are paved, with acres of grassland where I imagine houses and buildings will stand one day. Today though, it was clear snow-covered play land for my rig and I. I ventured to a remote portion of the development, and tried my hand at some snow donuts. It's more difficult, to make donuts on Valencia than it was on Natasha, my '96 Ural Sportsman. I'm thinking its because the Sportsman had fulltime 2WD and Valencia doesn't. Weird. Donuts finally out of my system, I motored out of the development and headed on back home via Tower Road to Colfax, to Picadilly Road. Once on Picadilly, I detoured onto a dirt road that was delightfully snow-covered and crossed a large field used for wheat growing during warmer months. This dirt road eventually turns and dumps one onto the parking lot of the E-470 Tollway Administration Building. Temperatures had now soared into the low teens and it was feeling almost balmy in comparison to earlier in the morning. It was time for lunch so I headed on home. 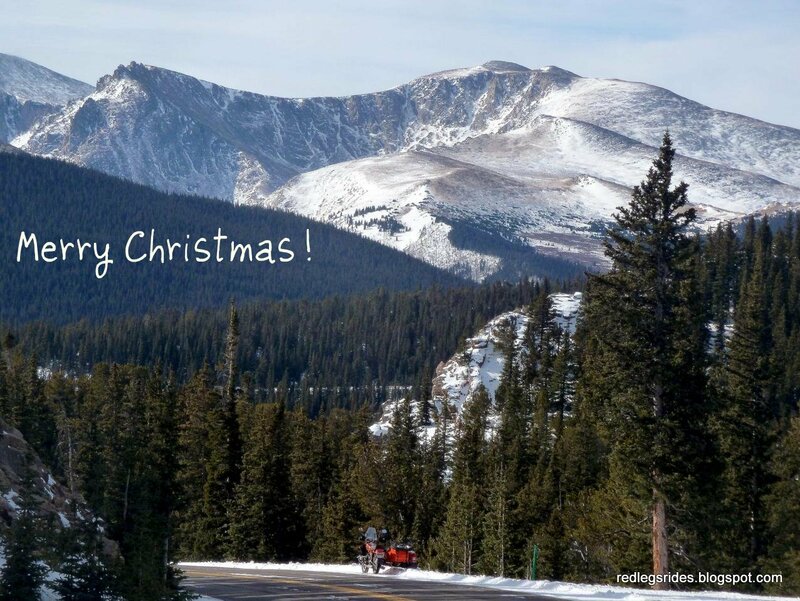 Yep, just the right amount of snow for Christmas Day and this rider.....hope your Christmas Day was as great as you hoped. Mine sure was! 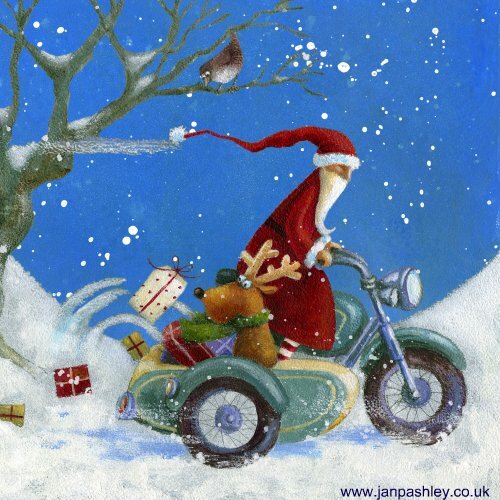 I hope your Christmas is as great as you hope it will be and that you can still ride a bit more before year's end. Now that all the end of the world doomsday scenarios associated somehow with the Mayan Calendar ending yesterday are behind us; I thought I'd take a ride to find some snow in the mountain roads near Echo Lake. Echo Lake lies near the junction of CO103 and CO5. CO5 is the road up towards the summit of Mount Evans and it's closed for the season. CO103 links Bergen Park and Idaho Springs, kind of paralleling the I-70 Super Slab and providing a rider some very nice views of nearby mountain peaks once you get above the treeline. I transited the Denver Metro Area using US285 which I took to the small foothill town of Morrison. From there it was twists and turns along Bear Creek Canyon Road, through the small towns of Idledale and Kittredge till I arrived at Evergreen. Cruising though Evergreen, I followed CO74 until the turnoff for Upper Bear Creek Road. This is a narrow two lane road with swanky residences on both sides of the creek. Mind the curves and the blind turns! Soon enough I got to Golden Willow road for the first show of distant snow covered peaks. Turning back, I got on Witter Gulch Road to climb up to CO103 a.k.a. Squaw Pass Road. This dirt road was covered with a thin layer of packed snow, liberally sprinkle with sand so traction was not so much of a problem. There was a bit of fishtailing on the hairpin turns since one has to maintain momentum while turning but nothing heart-stopping. I got onto Squaw Pass road and cruised the 10 miles or so to Echo Lake, keeping my speed slow as this paved road was mostly covered in snow and packed ice. Ironically, temperatures up at altitude were warmer than they had been down in Evergreen! It had been 13°F down there and it was almost above 32°F at the higher altitude! Weird. I basically had the road to myself, that and the balmy temperatures made it an easy going ride towards the summit. I got to Echo Lake and found it frozen over but quite scenic. It was nice and sunny, with very little wind up by the lake, good day to take a hike around the lake for instance. for the Mount Evans Summit road. Turning back and retracing my route, I stopped briefly at the usual overlook for the "on a clear day you can see forever shot". A few miles further, I came to the junction of CO103/Squaw Pass Road and Squaw Pass Trail where the pass summit sign is located. Continuing to retrace my route back to Witter Gulch Road, it was easy coasting down this snow packed dirt road, glimpsing a herd of deer along the way. I realized, on the first hairpin, that one has to slow way down otherwise you end up in the oncoming lane. Usually, not a good thing. The rest of the day's ride was paved twists and turns on CO74, back through Bear Creek Canyon, past Red Rocks Park and into the town of Morrison once again. I got home around 2:30PM or so, with temperatures now in the high 40s and low 50s in the metro area. There's rumors from the weather guessers of snow on Christmas Eve, I am hoping they are correct. As it is with most snow storms here in the great state of Colorado, the snow was not destined to stick around long after it had fallen. Today things warmed up considerably from yesterday, with the temperatures in the low 40's as I rode out during lunch to take a look around. Sure, it's still a bit brisk but I fear it'll warm further and the roads will be dry by tomorrow, permitting riders with only two wheels to venture out if they feel the urge. Wandering further to the north of the above location, I saw that the mountains of the Front Range were nicely lit and visible with just a bit of haze softening things. The main roads were simply wet, the neighborhood streets still had snow on them but it won't last long. I'd swapped the new Heidenau K37 tire on my spare wheel for the worn Duro 307 on the pusher wheel on Valencia. The grip was much better today but then again, not the same loose snow conditions of yesterday. The storm is presently hitting the Midwest and Great Lakes area I believe. We're supposed to maybe get some more snow for Christmas Eve, that'd be a nice Christmas present for yours truly. Finally, a real snow fall for the Denver Metro Area. I've got about four inches, probably more by the time I get around to it, to clear off the driveway before Martha comes home from work. We woke to falling snow which varied in intensity throughout the day. Did some riding in the morning but didn't get a chance to take pictures, nothing much to take pictures of anyways where I was riding. Lunchtime however, rolled around and snow was still lightly falling in what I would call a "snow mist". The neighborhood streets were of course snow-covered and the principal roads were not much better depending on how recently the city's snow plows had been by. Temperatures were around 16°F or so, a bit cold but not when wearing the appropriate amount of correct gear. The winds were blowing pretty strongly, causing the snow to pile up in drifts but also helping keep some road sections clear. Valencia got me to the usual picture spots with no issues though I could feel the pusher tire sometimes fighting to gain traction when coming off a standing stop! I guess the tire is worn enough to start thinking about swapping out the pusher tire with the new tire on the spare wheel. Nice but short ride, perhaps I'll go out again after clearing off the driveway after work. The eastern plains are supposed to really get a whole bunch of snow so perhaps some riding eastwards is in order this weekend. Yesterday was a mild day here in the Denver Metro Area with temperatures forecasted to reach a high in the upper 40s. I left shortly after 9:30AM and left the metro area behind me using US285, heading towards the small town of Grant, CO.
Grant, is the southern end of the Guanella Pass Road, the northern end being anchored by the larger town of Georgetown on the I-70 Super Slab. The idea today was to do a route reconnaissance of Guanella Pass Road and see how far I could get now that snow plowing has stopped for winter. This is the same road that fellow Uralisti and other assorted snow riding maniacs try and ride during the annual Elephant Ride. Here's a link to this past February's Elephant Ride: LINK. The ride out from Denver was very smooth, with very little traffic along US285. Temperatures dropped into the 20s once I was past the foothills and past the town of Conifer. Turning onto Guanella Pass Road once I reached the town of Grant, the first five kilometers or so were just bare dirt road. Though I could see signs of snow in the forest to the sides of me, none on the road itself. 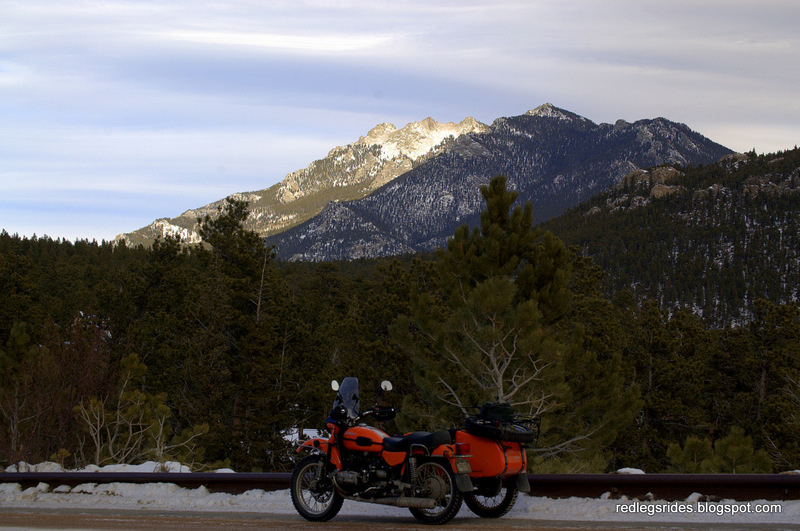 Soon enough though, I saw traces of snow on the dirt road and then it became hard packed snow covering the road as I gained altitude on Valencia, my 2011 Ural Patrol Sidecar Rig. I kept the speeds down as I wasn't in a hurry to end up in a ditch. I was able to maintain good speed, using mostly first and second gear. First gear on the inclines and second on the flat stretches. There were spots where the snow was a bit deeper than the inch or so that covered most of the road, and I could feel the rear tire trying to slide out from under me. Still, I eventually made it all the way to the closed metal gate that bars progress about a mile+ from the summit of Guanella Pass. The last few hundred feet, I had to engage 2WD as there was a stretch of deeper snow that just using the pusher tire couldn't get the rig through. The coldest it got up in the gate area was 12.5°F, so not too cold or unbearable. Thought, I'll admit, I found myself wishing I'd worn the thermal underwear! and is where most folks need a push to get their motorcycle through. There's a large flat valley through which a stream courses just south of the junction of Bruno Gulch Road and Guanella Pass Road. Before I got back to this valley though, I turned west onto Bruno Gulch Road to see what I could see. I didn't go more than a mile I think, and the road started to get a bit snowier and narrower. I turned around at what looked like a National Forest campsite as I'd neglected to bring along with snow chains and didn't want to get stuck. the junction with Guanella Pass Road. I rode back down towards Grant, CO without any incident or issue. As Mr Gravity was now my friend, I was able to keep the rig in second gear most of the way down. Getting back onto US285 at Grant, I headed back towards Denver. Temperatures had soared into the high 20s once I got back on the highway and it felt positively balmy when compared to temperatures at the top. I made only one quick stop, at the Santa Maria Camp location. 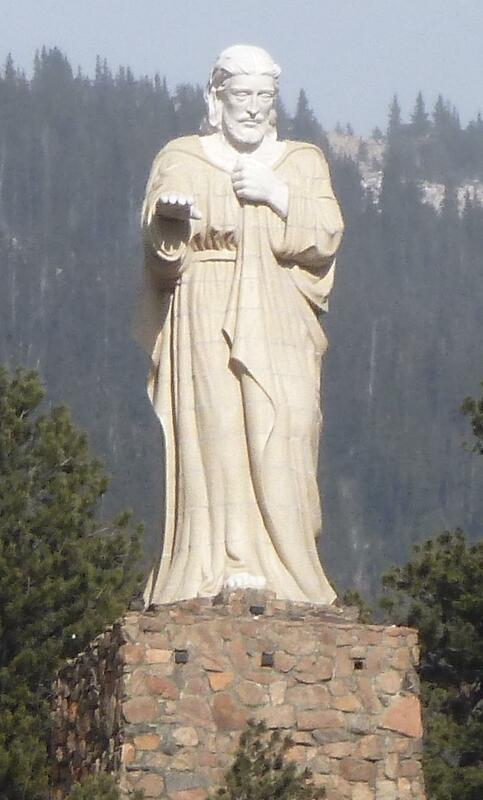 I was able to walk in enough to take a picture of the statue one can see from US285. 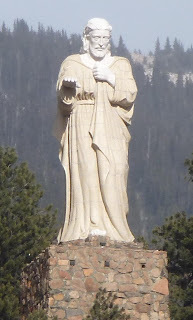 Given the name of the site, I had always thought it was a statue of Santa Maria.....not quite. here's Valencia by the shrine near the entrance to the camp. I saw two other motorcycle riders today, one near Conifer and the other near Windy Point, both on US285 so I wasn't the old cold weather rider out there. Such a mild winter so far, hope you got a chance to ride.